« What now for Brexit? If not a hard Brexit, then what? 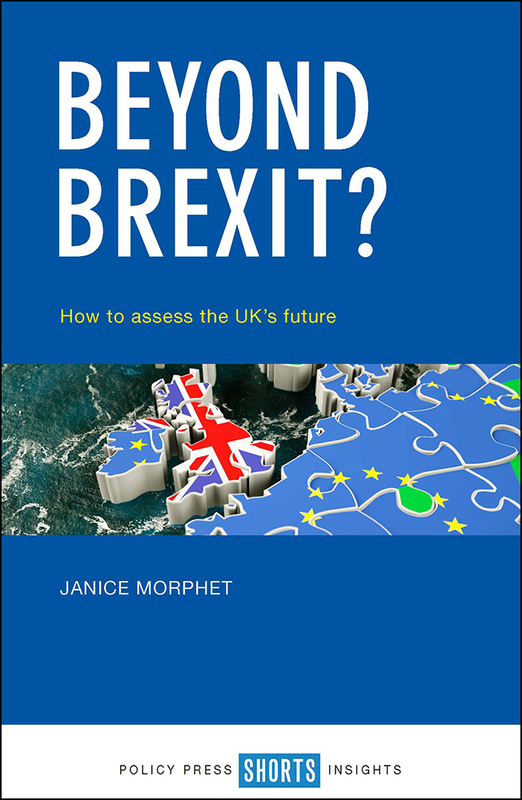 Now that a ‘hard’ Brexit seems less likely, Janice Morphet – author of Beyond Brexit? – looks at alternative options for the UK’s relationship with the EU. “Following the apparent disruption of hard Brexit that has followed the General Election, it is now time to review the other options available to the UK. It would have been better to review these before the referendum was called and to explain the options to more fully inform the electorate during the campaign. Even after the referendum result, a review of the options would have been helpful rather than the incoming Prime Minister opting for the hardest form of EU/UK relationship without appreciating the paradox that her social welfare agenda could best be achieved using EU values, programmes and policies. However, better late than never. So what are the real options available rather than those frequently suggested by those politicians less familiar with the EU? The most frequently discussed approaches are the potential for the UK to return as a member of the European Free Trade Association (EFTA). This was set up in 1960 by the UK as an alternative free trade bloc to the EU when the UK realised that it had made a mistake in dismissing membership of the then Common Market. Its members are now Iceland, Lichtenstein, Norway and Switzerland. While EFTA works as a group on some issues, its members have different relationships with the EU. This might suit the UK, but Norway has already indicated that it may not take the UK back into EFTA membership. How do these relationships work individually? In addition to being a member of EFTA, Norway is also a member of the European Economic Area (EEA) and takes the EU legislation and policies in the areas that are agreed. Norway has not taken the fisheries policies for example and nor is it a customs union. However, in this model, the UK would still have to pay a contribution but would not have a seat at the table in the development of policy, legislation or programmes. A variant of this that is frequently cited is the Swiss model. Switzerland is not a member of the EEA or the customs union but has taken many EU policies for the single market that also include regulation and makes contributions to the EU. It is also part of the Schengen agreement. It is also outside the financial services agreements. The Swiss have bilateral agreements that align their legislation to EU law without them being part of the EU. However, the Swiss have tried to resile from free movement of labour but lost the legal case where they challenged this. On the other hand, given its specific geography, Switzerland has been in receipt of considerable transport funding from the EU to support improvements across the centre of Europe. While the UK might hope for something similar, as it is between Ireland and European mainland, there are other options via short sea shipping routes which may not make this as appealing to Brussels. Lichtenstein is part of Schengen, the single market and the customs union although it has a specific interpretation of the free movement of labour. What other options are there? Turkey is a member of the customs union that provides tariff free trade and this agreement was concluded as part of the process of Turkey’ accession to the EU. Turkey can make some external trade agreements but tariff levels must be in alignment with those made by the EU. There is also the EU’s neighbourhood policy for its relationships with it geographically close states. Here the Ukraine model emerges for consideration where there are trade agreements but these are subject to tariffs and quotas although these generally are expended early into any year when following which higher tariffs apply. The EU also has a range of agreements with the so-called micro states in Europe. For those on the EU mainland, this includes being part of the Eurozone, generally being part of Schengen, the customs union and the single market, sometimes via another member state. The outliers here are Jersey, Guernsey and the Isle of Man. Here the arrangements vary although there are several issues currently live on their practices in financial regulatory frameworks. Gibraltar is taken as part of the UK but is not part of the customs union. There are also agreements with nine enclaves – parts of one country surrounded by another. Finally, there are the possibilities of bespoke free trade agreements such as that recently concluded with Canada that took many tears to finalise and is primarily focused on goods rather than services. At a looser level, but more focused on the practical delivery of services across land borders and beyond, there is another approach – the European Grouping of Territorial Cooperation (EGTC) that would certainly manage many of the issues across the island of Ireland land border. Here we find that Switzerland participates in two EGTCS but Norway does not have these agreements in place. The EGTCs are legal instruments and can cover most things except security. Firstly, that the EU is flexible and can reach and maintain numerous different relationships with countries within its geography or beyond. This means that a bespoke arrangement between the EU and the UK is possible. Secondly, though, as the Swiss experience has demonstrated, that the terms of specific agreements, such as membership of the Single European Market, carry requirements such as free movement of labour that will be mandatory. On the other hand, the UK has not used the many EU powers available to manage free movement of labour that would respond to many of the issues around controlling migration. Each of those countries with specific agreements with the EU can advise of the advantages and disadvantages of their arrangements – the Prime Minister of Norway, for example, has advised the UK not to pursue their option. It is time to examine these within a realistic framework and in the context of what the UK has already, including an examination of what will be lost in each model that might be available. Then Parliament can make a decision. 2. members of the EEA can unilaterally invoke art 112 (immigrant quotas) of the EEA agreement.